When it comes to roto-moulding, having the right tools is half the job, so we’re looking at investing in a brand new roto-moulding machine for our shop floor. Though obviously effective management and a positive attitude go a long way, maintaining a high standard where our equipment is concerned is what allows us to continue delivering a quality service to you, our customers. We’re all about keeping up with customer demand here at Excelsior – which means we’re always on the lookout for ways to improve efficiency, without sacrificing any of the quality that makes us so highly valued by our clients. A new roto moulding machine will bring a range of advantages; amongst them are shorter processing times, allowing us to manufacture products faster than ever before. This lets us improve our rate of production, meaning that we can take on ever-more demanding projects and add capacity to our busy shop floor. Another major bonus that a new roto moulding machine will give us is an even finer degree of control over our products, and this involves more precise estimations when it comes to predicting tolerances. If you’re not clued up on the industry terms, by the way, a product’s tolerance is essentially the degree to which it varies between iterations. Usually a design allows for an element of shrinkage, and because of the process parameters this means that product sizes can vary by a very small margin sometimes (which is to be expected). The way that we deal with any tolerances is usually through the use of cooling jigs. But if your product has a typical ‘tight tolerance’ – in other words, a very strict one – it means that the size difference should show no more than a 1-2mm variation from the CAD drawing. If you’re thinking “wow, that sounds tricky to manage”, it can definitely be challenging! That’s why an increased level of control over tolerances is one of the most important benefits that we’d enjoy from a new roto-moulding machine. Some of our clients won’t need to be that strict, but at Excelsior we always believe it’s good to have the option in case we need it. Increased reliability is another of the most important advantages we’ll get from a new roto-moulding machine. 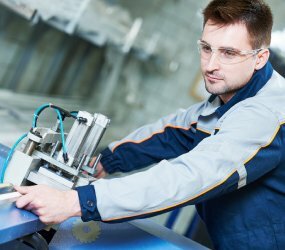 While our current machines are more than up to the task when it comes to meeting customer demand, breakdowns do sometimes inevitably happen. A modern machine and bang up-to-date design, produced by one of Europe’s leading manufacturers, will enable us to manufacture more products more efficiently, and we expect the machine to be in operation around the end of July. Of course, new machines notwithstanding, we’ve still got the tools, the skills and the attitude to help make your plastic product idea a reality. Contact us on 0161 765 2010, or email us at sales@excelsior-ltd.co.uk today.